Fremont Indian State Park was established to preserve Clear Creek Canyon’s treasury of rock art and archaeological sites. A visit to the museum (conveniently located in the Visitor Center) begins with a video program introducing visitors to the Fremont Indians. 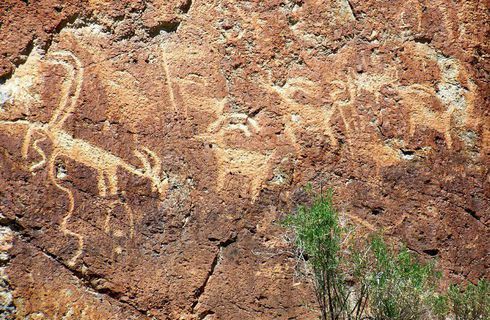 Twelve interpretive trails, one of which is accessible to wheelchairs, lead you into legend and history depicted through pictographs and petroglyphs. Also enjoy rock art, interpretive trails, fishing, horseback riding. The park is 21 miles southwest of Richfield on Interstate 70 in Central Utah. Fishing, hiking, camping and picnicking are available. The Utah State Legislature appropriated money in 1986 for the construction of a museum to display the artifacts left in Clear Creek Canyon by the Fremont Indians over 800 years ago. Dedicated in 1987, the museum offers a more in-depth understanding of the Park, its history and former inhabitants. The Fremont Indian State Park is open year round. Maximum RV Length – 30 ft.
Fremont Indian State Park has many amenities available which vary by season.